Thank you for choosing Animal Welfare Society as a place to find a pet! The adoption center is a welcoming and friendly place where great people and deserving pets connect. It’s the place where new adventures begin! If you are interested in adopting a new companion for yourself or for a family member, there are a few things we’d like you to know. You are welcomed to visit adoption center as often as you like to visit our animals. Our population often changes on a daily basis with new pets looking to meet you! For a current list of pets available for adoption, visit our dog, cat or small animal adoption pages. We are open from 11 am to 4:30 pm daily (except for Wednesdays when we are closed for adoptions and visits). We have extended hours in the summer months. Our simple and straightforward adoption questionnaire is an easy start to the adoption process. This questionnaire is our preliminary way of getting to know you. It provides our adoption counselors with talking points for the discussions we’ll have together about adopting your new pet. Your answers provide insights about your expectations, interests, experiences, lifestyle and family dynamics. With this information, we are best prepared to answer your questions about the pets you may be interested in adopting. You can download and complete the adoption questionnaire in advance and bring it with you, or complete it on-site. Visiting with prospective new pets is an opportunity to get to know their unique personalities so you can choose a pet that you think is right for you. It is not mandatory, but we encourage you to get the whole family on board by bringing everyone who lives with you along. This gives each household member the opportunity to interact one-on-one with your prospective pet. We have several areas at the shelter where you can spend quality time as a family to get to know your new pet. With regard to fellow canine family members, dog-to-dog introductions are handled on a case-by-case basis. We will work with you to determine if an introduction is in your resident dog’s and your prospective dog’s best interest. You do not have to bring your resident dog with you when you are stopping by to meet available shelter pets. Our staff members spend considerable about of time with the animals each day, so they are always happy to share information and stories. Don’t be shy – please ask any and all questions that come to mind, before, during and after the adoption process. We are here to help and will gladly answer all of your questions. Adoption fees vary from species to species and depend on an animal’s age, breed and size. 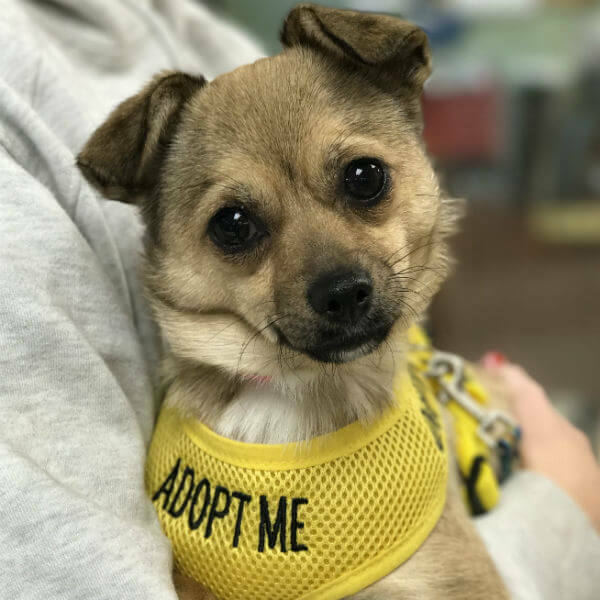 Adoption fees are listed on each individual animal’s web profile and on a card on/near their kennel/space in the adoption center. Learn more about our adoption fees and the great benefits they include. Depending on your area of residence and housing arrangements, we do encourage adopters to think ahead before adopting. It can be quite helpful to know for certain that pets are welcomed where you live. Think about applicable local ordinances, homeowner’s and/or renter’s insurance policies, rental agreements, parental consent, approval from roommate(s), etc. You do not need to make a decision on adoption the first time you stop by, though many individuals and families do. We will continue to work with you throughout the process, as you decide upon the pet that is just right for you! However, please keep in mind that adoptions are on a first come, first served basis, particularly for highly sought-after pets. Adoptions begin at 11am. However, on days when highly sought-after pets (particularly puppies) first become available, parties may arrive prior to this time and begin forming a line. Starting at 8 am, we will have a sign-up sheet hanging on our front door. Interested adopters arriving early can write down their name to ensure their place in line when visits and adoptions begin at 11 am. 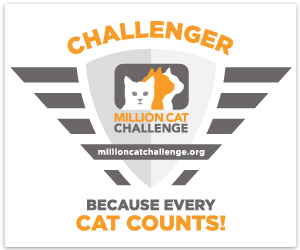 We are proud participants in the Million Cat Challenge. Click here to visit their site for more information.